Silhouette Soft Thread Lift is the minimally invasive treatment which addresses two primary facial ageing concerns: sagging skin and lines and wrinkles. The procedure uses bio-absorbable threads placed under the skin to lift and restore facial contours. Additionally, the threads stimulate the skin’s own collagen production process, resulting in a firmer and smoother appearance in the area treated. The treatment involves placing special sutures under the skin, which are secured in place by bio-directional cones. Unlike traditional, surgical facelifts, Silhouette Soft® doesn’t require incisions or multiple stitches. The lifting effect that the procedure provides will soften over time but it will stimulate collagen for a more prolonged smoothing and firming effect. Unlike a surgical facelift, Silhouette Soft® does not require a hospital stay, a general anaesthetic or a long recovery period. Silhouette Soft® is suitable for anyone who is experiencing sagging skin, a softening of facial contours and deeper lines or wrinkles. 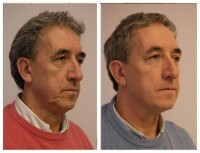 As well as being effective in the cheeks and upper face, the lifting effects of Silhouette Soft® work well to tighten sagging skin around the jowl. Absolutely. For example Silhouette Soft® could be combined with facial fillers to address loss of volume in the cheeks or INTRAcel to boost skin firmness. We will recommend the very best combinations of treatments to create the optimal and most natural-looking results. All the options will be discussed during the consultation process. Do the Silhouette Soft® threads have to be removed again? No, the threads are slowly absorbed by the body, which in fact helps to stimulate collagen production. This helps to restore some skin firmness and will result in a reduction in the appearance of lines and wrinkles. The development of Silhouette Soft® is based on 6 years of experience in suture suspension with cones used in reconstructive surgery and cosmetic surgery in the United States (Silhouette Lift®). Silhouette Soft® is made in Michigan in the USA and is subject to numerous sanitary controls. Silhouette Soft® received CE 0499 approval and the ISO 13485 standards are in accordance with European Directive 93/42. No, the treatment is performed under local anaesthetic, which is applied to certain points in the area to be treated so there is no pain during insertion of the suture. Some patients may find the procedure a little uncomfortable and any pain after the treatment can be managed with over-the-counter painkillers. What is the preparation before Silhouette Soft® treatment? No special preparation is required prior to Silhouette Soft® treatment. However, we recommend that you discuss your expectations and ask any questions you have before starting treatment. As with all procedures it is important to inform us of any treatment you have already received and of any medicines you are currently taking. Only doctors who have been thoroughly trained in Silhouette Soft® sutures are authorized to implement the treatment. After the Silhouette Soft® treatment, as with any cosmetic treatment, some slight swelling, redness or bruising may sometimes be observed, but these effects will disappear within a few days. There is sometimes a slight wrinkling of the skin (required for optimisation of the treatment), which disappears very quickly. If you experience any side effects, contact the clinic and we will be able to respond to your questions.